All the tools you need - provided by Bravenet. Bravenet's world class hosting services are build for speed, reliability and comes with the highest protection SSL security to keep you safe from hackers and malware. All our servers are owned and operated by us, located in Vancouver and backed with our exceptional customer services. 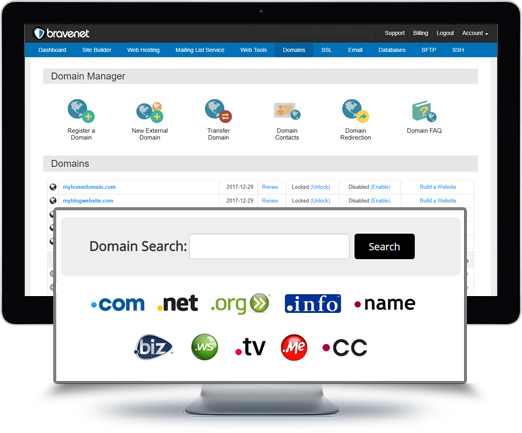 Our hosting manager is loaded with features and easy to use. 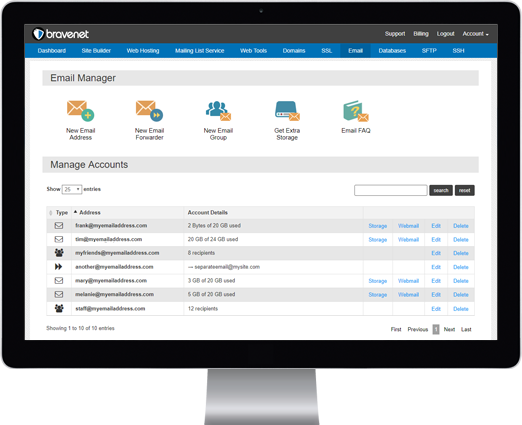 Manage and access your email, domains and SQL databases with ease. SSL Certificates are a must for any website interacting with visitors as it creates trust with your customers and search engines improving your SEO, rankings and sales. 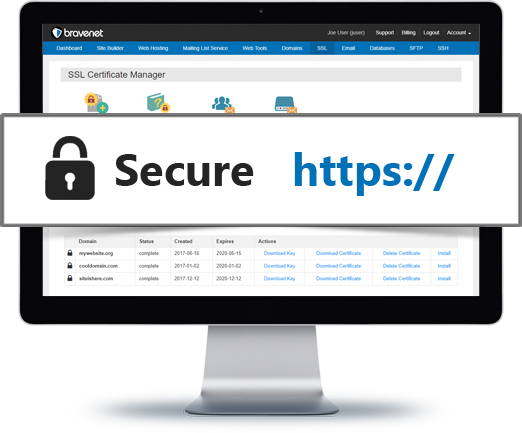 Bravenet encrypts and secure your website and protects both you and your clients data with up-to-date HTTPS / SSL (Secure Socket Layer) website security certificates. We offer custom domain names that fit your brand at a price you will love. Searching, securing and setting up your domain on our system are a breeze and if you need help we are always glad to hear from you. If you already have a domain, no problem, we will help you update your domain to match with our servers. Our 100% Vancouver based Email Hosting servers remove the burden of securing and managing your email. Get custom email addresses and reliable, secure email hosting with anti virus and spam protection with every domain. If you need help our local team is standing by to be of service. 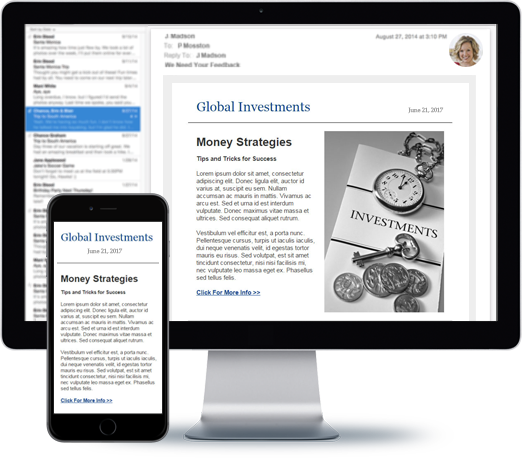 Managing your email campaigns and subscriber lists have never been easier. 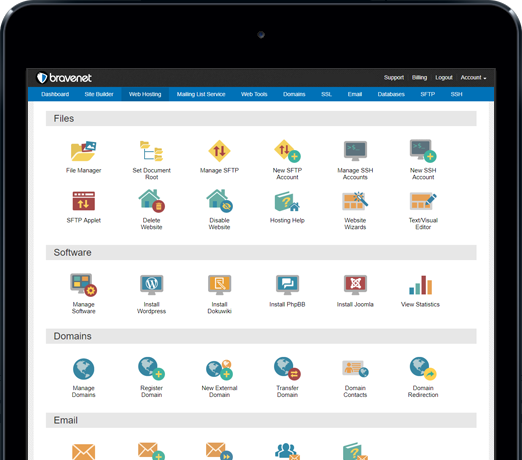 Bravenet's campaign manager allows you to organize and tag subscriber lists, create drafts, build, edit, send and schedule individual or group email. Then track your success in real-time with statistics that give you all the data you need to evaluate and optimize each campaign.